The largest expenditures in the Sheriff’s Office budget are personnel and operating costs. 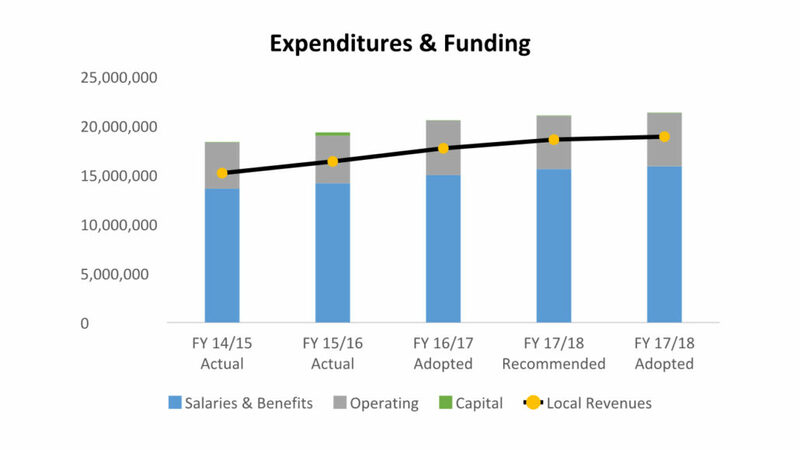 Over 70% of local funding is allocated to salaries and benefits alone, leaving the remaining funds for operation. The major operating expenditures include our inmate food and medical contracts and our share of the public safety communications maintenance contract. The Sheriff’s Office periodically renegotiates its revenue generating contracts to ensure the County receives competitive reimbursements. Although care has been taken in preparing the information contained in these documents, Gaston County does not guarantee the accuracy thereof. Anyone using the information does so at their own risk and shall be deemed to indemnify Gaston County from any and all injury and/ or damage arising from such use. All pages are copyrighted by Gaston County, or by their respective author - whether a copyright line appears at the bottom or not. Gaston County has no control or liability for information on other websites linked to this page. These links are provided only as a service to the user.